Come celebrate the return of a million sockeye salmon to their spawning grounds on the beautiful Horsefly River. 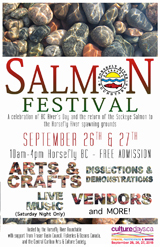 The Horsefly River Roundtable would like to invite you and your family to join our community September 26 & 27, 2015 for the annual Horsefly River Salmon Festival. 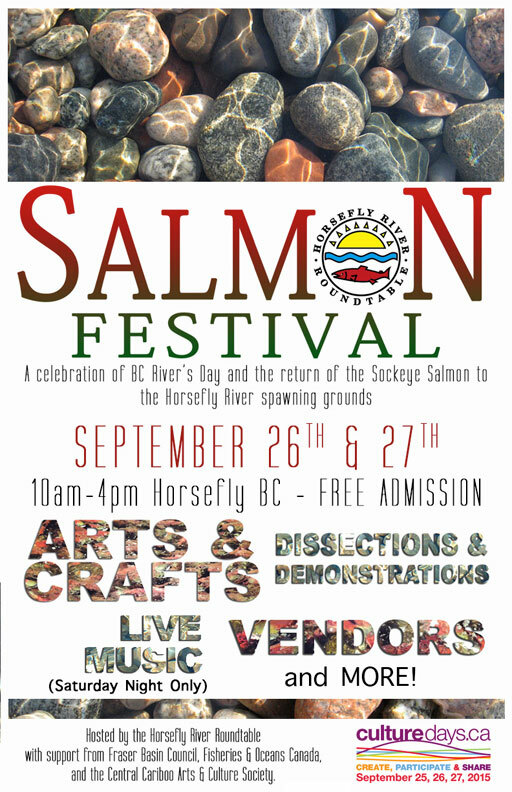 Come and celebrate with us the return of sockeye salmon to their spawning grounds on the beautiful Horsefly River. Follow our fully accessible Horsefly Salmon Habitat Trail to the Spawning channels and learn more about this wonder of the natural world. Several years ago TLC took part in a funding campaign to support salmon habitat protection in the Upper Horsefly River. Please note that this post is NOT part of a current campaign. We just felt it was time to share this around again. Give this salmon a round of applause! Have you ever seen a river red with Salmon? Watched a bear grab a salmon and feast on it? Seen salmon jumping up a waterfall?